Life is about balance, they say. Happiness is not a matter of intensity, but about balance, rhythm and harmony. As any athlete will tell you, training for a particular sport or activity involves a number of different exercises: these actions awaken our muscle memory all over the body, making us feel aware of our movements, ready and balanced. Teaching our bodies to listen to diverse nuances in movement will strengthen our overall self-perception, allowing us to sense where our body has to be without looking. Balance is a learned exercise, it builds muscle, increases our joint mobility and improves posture. It also is enormously beneficial to the mind, helping to improve concentration and body awareness, contributing to general wellbeing. 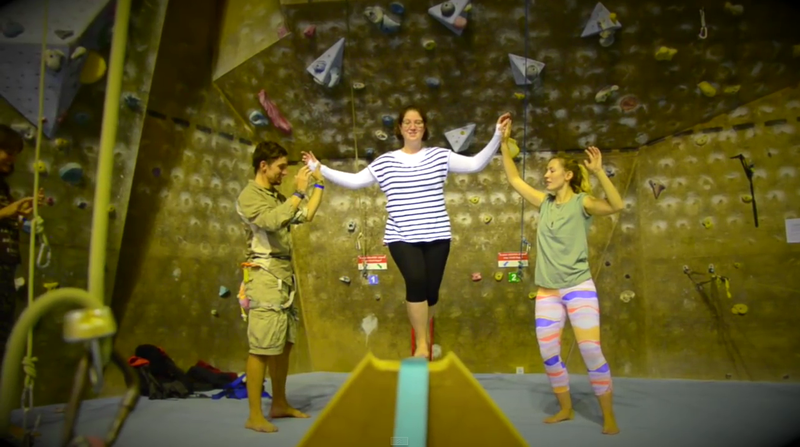 There are many ways to learn how our bodies fare in balancing and our friends at Climb Fit Sydney prepared a special event to test this out and to open our eyes to different ways of exercising. 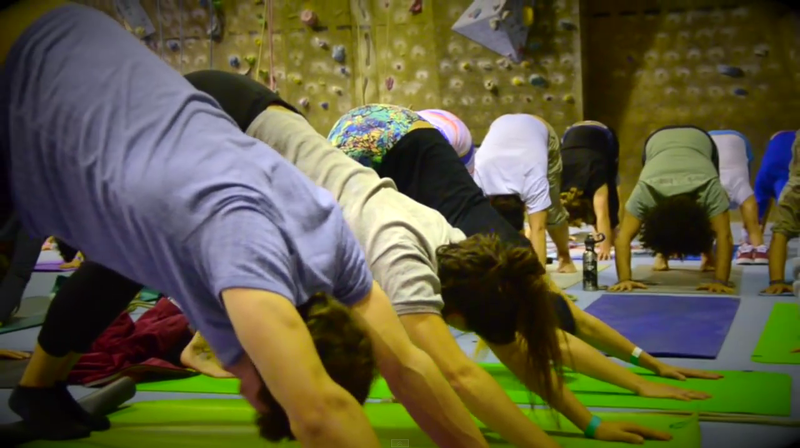 By combining Yoga with Slacklining and Rock Climbing, the Balance LAB brought us back to basics, back to movement that teaches you to listen to your body rather than the other way around. Many people have tried one of those activities, but not many have done all of them, so I just wanted them to experience something new, and possibly find a new passion too. The evening started out with a collective ‘uttanasana’, and a selection of yoga poses that got everyone’s blood pumping and muscles warmed up. As a wave of 80 people breathed collectively under Shawn Mclaren’s guidance, an energizing rush invaded mind and body, our arms and legs outstretched in delicate symbiosis. The idea of setting up the Balance LAB was not only based on the prospect of teaching ways to exercise that enhance balancing skills, but also to bring together a community of neo and experienced enthusiasts. The shared practice was perfect for fostering new connections and exciting skill-sharing. For any kind of athlete, whether you are amateur or professional, it’s important that your skillset remains diverse: muscles are malleable and the body is flexible, why not teach it something new? There is always someone around who you can learn from! Balance is hugely important mostly because there’s a sense of confidence that comes with balance that people don’t often realize. Balance also requires a lot of symmetry and co-ordination in the body, and in this day-and-age our bodies are not necessarily that symmetrical or coordinated, so its about bringing those skills back to life as well. Next up was Slacklining, a discipline that involves balancing on a piece of nylon webbing stretched between two points (usually trees, in this case a wooden base!) and attempting to cross the full length of it. Ryan Sleiman of Slack2Basics showed us the ropes by expertly balancing on the slackline, his core strength at work but his body fluid and sensitive to the movement of the line. In this case balancing also means being perceptive to the tensions in the line. Maintaining that balanced position becomes a total body experience, even waving one hand in the opposite direction can throw you off completely! 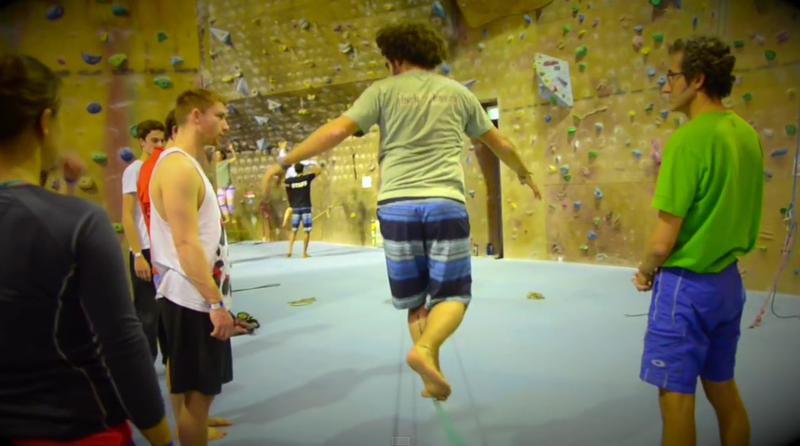 Ryan teaches workshops in balance through his slacklining company, and the benefits are immeasurable: “Balance is fundamental in every sport and activity. Learning how to balance increases proprioception, improving self awareness, how body movements affect ones balance and reduces the risk of injury. Isolating the skill (or art) of balance allows one to subconsciously apply this in daily activities such as walking and running or sports such as rock climbing, hiking cycling, yoga etc…” he comments. 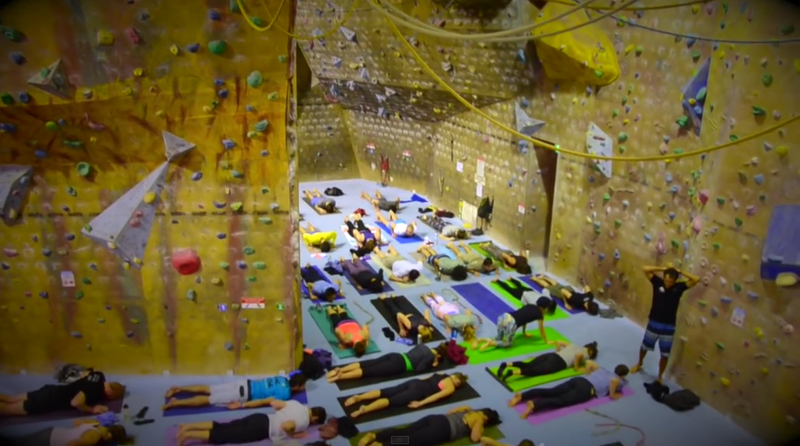 Yoga, slacklining and rock climbing all share the fundamental ability to master balance. These three activities challenge ones ability to build core balance with low impact to the body whilst increasing strength and most importantly, whilst having fun! 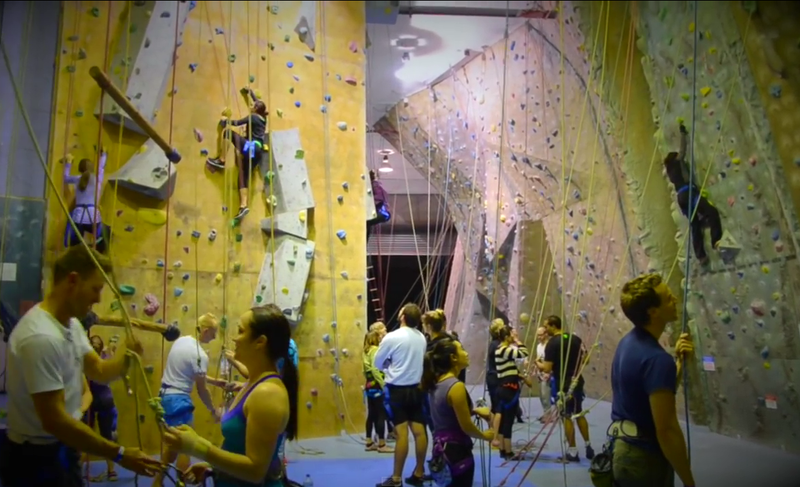 Rock Climbing was obviously part of the package with Climb Fit being the largest indoor climbing gym in the whole city: it boasts more than 160 different climbs suited to all levels of expertise. Hooked into a harness and with a partner at the ready, participants got the chance to scale entire walls. 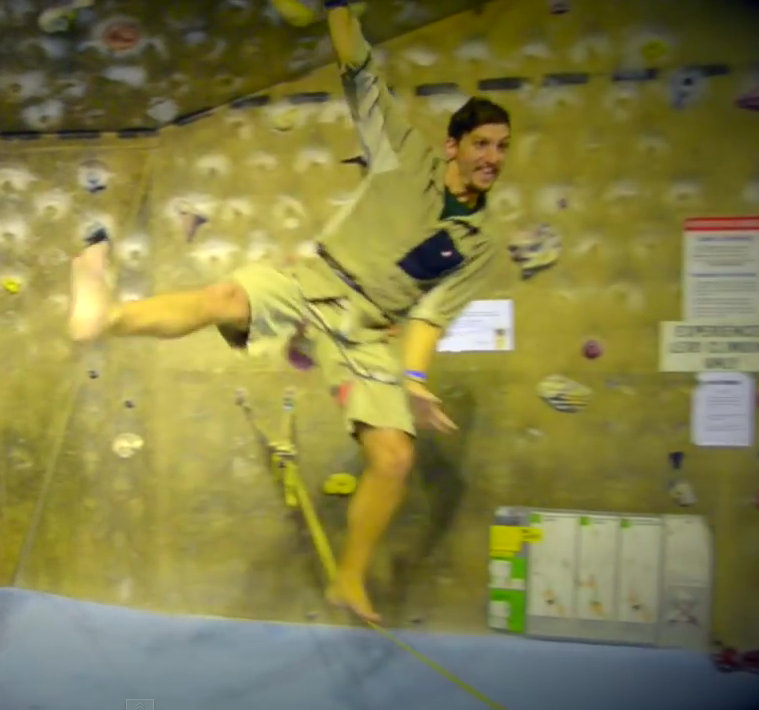 So what does rock climbing have to do with balance? Understanding where your Centre of Gravity is can make climbing a lot easier. By balancing your body accordingly you can reduce the strain of the climb. For example keeping your body close to the wall places the weight mostly on your legs, making it easier to find another nook to grasp with your hands. It brought people together from all different walks of life. 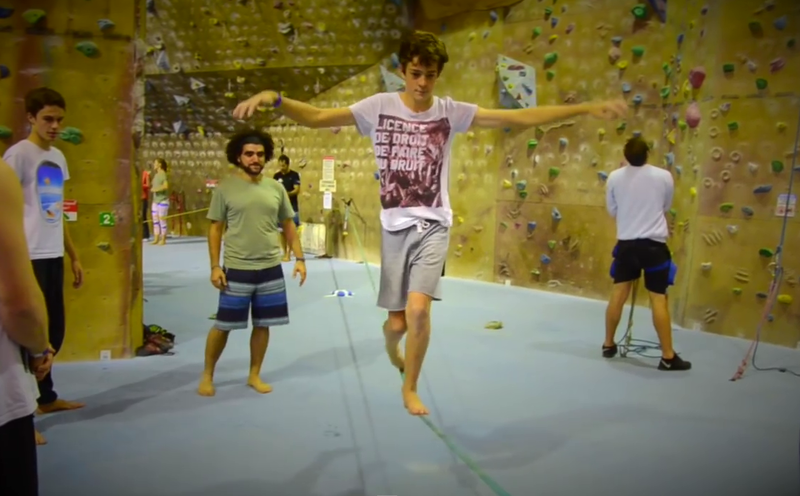 Many people have tried one of Slacklining, Yoga, or Climbing, but generally not all. So it was super nice to see all these people come together and help each other out. There is a huge sense of community that is born into Slacklining, and it was a triumph to see that community flourishing on the night of the Balance LAB! Next PostBroncos vs Cowboys. Who is offering better value on social media?